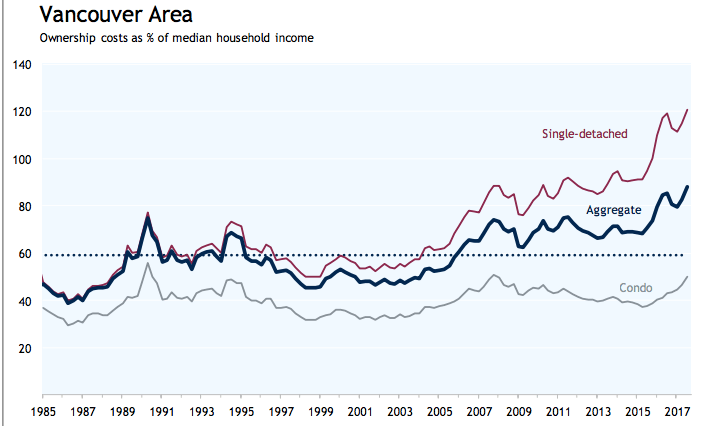 Nothing says Merry Christmas like a 27 year low for Canadian housing affordability. That’s right, real estate across Canada has not been this un affordable since the year 1990 per RBC. Spoiler alert house prices tumbled shortly thereafter. RBC Bank released their updated Q3 numbers for housing affordability. To no surprise, Vancouver leads the nation in the most unaffordable market to buy a home. Followed by Toronto and then Victoria. What RBC didn’t mention in their report is the correlation between elevated house prices that cause affordability issues and recessions. When too much household money is spent servicing mortgage payments it eventually becomes a drag on consumer spending and ultimately triggers a recession. This is not to suggest a recession is imminent. 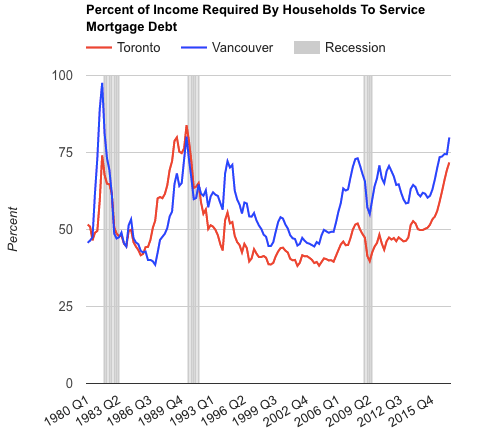 But when the percent of income the median family would have to use to service debt pushes above 50% in Toronto and Vancouver, a recession typically follows in Canada. Currently Toronto is at 71.7%, and Vancouver is at 79.87%. With the Bank of Canada expected to follow our US counter parts in 2018, a couple more interest rate increases are sure to erode affordability even further. Across Canada, Household income would need to climb by 8.5% to fully cover the increase in homeownership costs arising from a 75 basis-point hike in mortgage rates. Buckle in.